One of the annoying things with the WebSphere plug-in for IBM HTTP Server is that there is no straightforward way to suspend traffic to a given application server. The problem is that the plug-in is not aware of the runtime weights of the members in a WebSphere cluster. The only way to suspend HTTP traffic to a given server is to set the configured weight of the cluster member to zero and then to regenerate and propagate the plug-in configuration file. The plug-in will automatically reread that file and stop sending HTTP requests to the server. Alternatively, one can also edit the plugin-cfg.xml file manually to temporarily set the LoadBalanceWeight to zero. Obviously this method is cumbersome, especially compared to how this kind of operation is done on other load balancers. On the other hand, one of the advantages of the WebSphere plug-in is that it able to detect a stopped member and fail over the connections without loosing requests: as soon as it detects that the HTTP port on the WebSphere server is closed, it will redirect requests (including the request that caused the attempt to establish the connection to the application server) to other cluster members. Therefore another approach would be to instruct the application server to (temporarily) close its HTTP port(s) in order to force the WebSphere plug-in to route requests to other members. It turns out that this is indeed possible. Each application server has an MBean of type WebContainer with operations stopTransports and startTransports. The first operation stops all HTTP transports and closes the corresponding ports, i.e. WC_defaulthost and WC_defaulthost_secure (as well as WC_adminhost and WC_adminhost_secure on stand-alone servers and deployment managers). The second operation restores normal operation. As noted in PK96239, the WebContainer MBean was deprecated in WAS 6.1 and has been replaced by the TransportChannelService MBean. 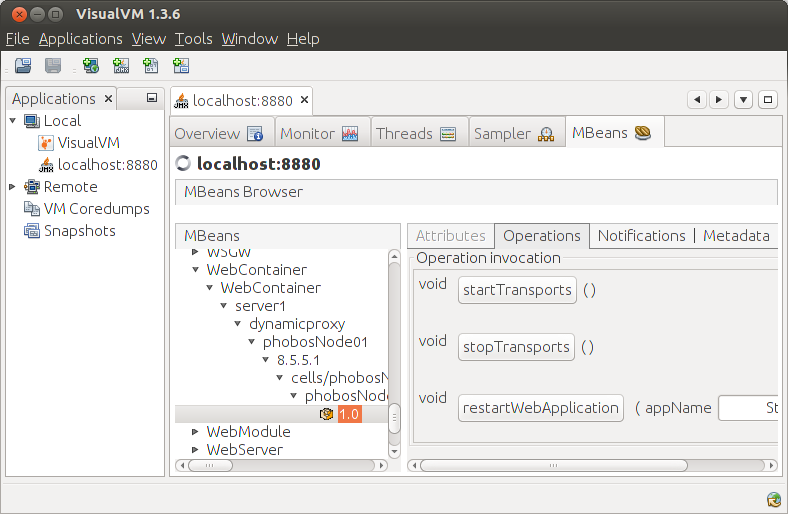 However, the latter is much more difficult to use and as of WAS 8.5.5, the WebContainer MBean is still supported. Therefore using the WebContainer MBean remains the preferred method to do this. It should also be noted that using the stopTransports to suspend HTTP traffic to a WebSphere server may have some drawbacks in certain situations. The most important one is that since the HTTP ports are closed, it is no longer possible to send any kind of HTTP request to the server. In particular it is no longer possible to send test requests directly to the server. One should also be careful if there are applications deployed on the server that may send HTTP requests to the server itself (via localhost) in response to requests received via protocols other than HTTP, such as IIOP (remote EJB calls) or JMS.